These 3/4″ x 3/4″ flags of Europe decals are made of vehicle grade vinyl. These mini flags of Europe stickers are a fun way to commemorate the countries you’ve traveled to in Europe. Easy on, easy off allows you to remove the sticker anytime you want. I love this product!We were so excited to receive our stickers! They are great. These 3/4″ x 3/4″ Country Codes of Europe helmet decals are made of vehicle grade vinyl. These mini country code stickers of Central and Eastern Europe are a fun way to commemorate the countries you’ve traveled throughout Europe. Easy on, easy off allows you to remove the sticker anytime you want. Great for helmets but also great for car or windows. You’ll be sure to spark conversation with riders and travelers alike when they see all the places you’ve traveled. These 3/4″ x 3/4″ US State Codes helmet decals are made of vehicle grade vinyl. These mini state code stickers of American states are a fun way to commemorate the states you’ve traveled throughout America. Easy on, easy off allows you to remove the sticker anytime you want. Great for helmets but also great for car or windows. You’ll be sure to spark conversation with riders and travelers alike when they see all the places you’ve traveled. Start in Boulder, CO and head north through the US national parks into the Canadian national parks ending in Portland, OR. Use our itinerary, or change it to suit your needs. Stay one day or stay 3, the call is yours when you purchase our self-guided route that will provide you with turn by turn directions from your phone or any device with connectivity. Buy this PDF and follow in our foot steps at your pace. Take our 27 day, 3730mi Parks of the West trip from Boulder, CO to Porland, OR and make it your own. When you purchase this downloadable PDF you will get point to point destination links in Google Maps. Google will guide you every step of the way. Don’t have a mobile device or prefer having something on paper? No problem, click the printer link and then print turn by turn directions to take with you. 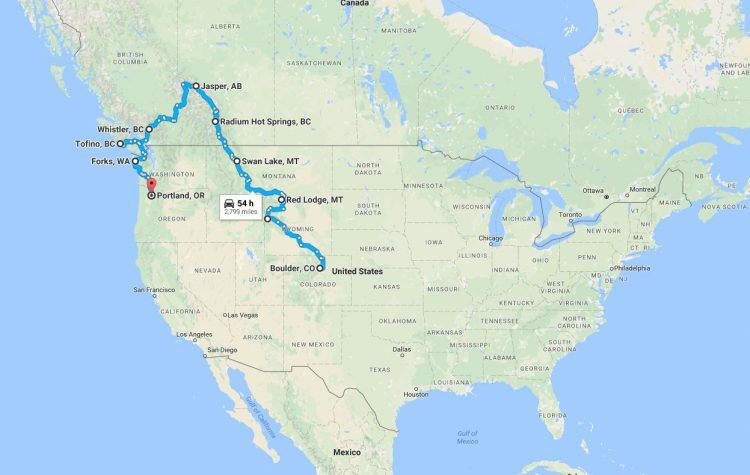 These maps allow you to travel at your pace with self-guided turn by turn directions from CO to OR traveling through the US and Canada, including Rocky Mt. National Park, the Grand Tetons, Yellowstone, Glacier National Park, Banff National Park, Jasper National Park, and other great destinations.